Fyrinnae’s most creative shadows are their Arcane Magic that changes color depending on the lighting and angle. I adore them. So, I was excited to try the newest Arcane’s that have a soft matte base. 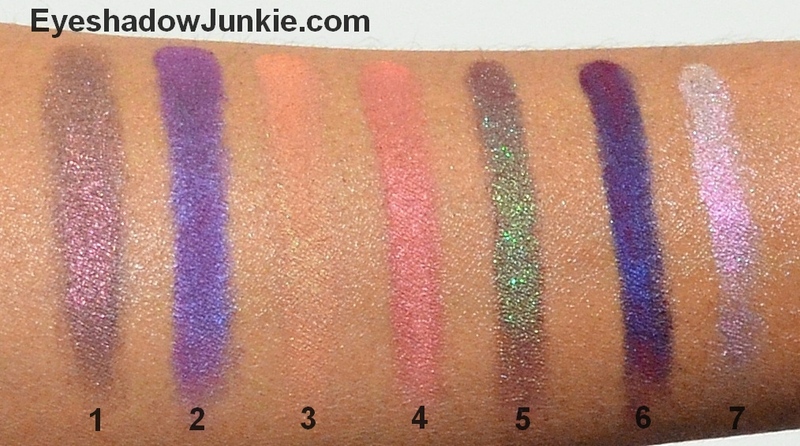 These shadows looked fantastic when viewing Fyrinnae’s swatches on their website, specifically the Gif. The shades look deep and rich with strong color shifts, per the Gif, but this is not what I saw when these arrived. Sadly, as a collection, these shades were disappointing. These shadows are simply unimpressive for an Arcane Magic release. Fyrinnae has released Arcane’s that will look like two distinct beautiful shades in one product, so the bar I’m grading these against is pretty high. I struggled to see the color change in some of these and others are color schemes that have been done many times before. The swatches on Fyrinnae’s website was done on a lighter skin tone. Perhaps my brown skin and the matte base colors of these do not play well with each other. I swatched these on top of Nars’ primer (above) and Fyrinnae’s Pixy Epoxy (here) didn’t get a better result. 1) Intergalactic Bookstore – is described as a brown matte with reddish-pink to green shimmer. The matte base is a cool, ashy brown with a lot of shimmer. To my eye, the pink shimmer changes to gold. I don’t see the green as described. 2) Aphrodite’s Evening Gown – is described as a dark purple base with a satin finish and blue violet to pinkish red shimmer. To me, this shade changes from a red-purple to a blue-purple, but it isn’t a dramatic difference. The shimmer is very fine lending to the satin finish. The color reminds me of a discontinued Fyrinnae shade called Nevermore, which was not an Arcane. 3) Wild Imagination – is described as a dark peach matte base with golden green to turquoise blue shimmer. I didn’t see a color change to this shade at all, despite the many angles I tried. When I first saw the shade in the pot, I knew it was not going to resemble Fyrinnae’s Gif or arm swatch. If this were marketed as a regular peach shade with green shimmer, great. That is what it is. An Arcane Magic it’s not. If I have to do a handstand at a nightclub to see the color change, it’s pretty pointless. 4) Diamonds From Mars – Is a neutral pink matte with coppery-red shimmer which shifts to yellow-green. The minute copper shimmer makes this pink warm than neutral as Fyrinnae described. As with Wild Imagination, I don’t see the color change at all. 5) Prismatic Thunderstorm – Is described as a burgundy wine base with lime green to blue to purple shimmer. I don’t see the purple, but I do see the switch between green and blue. This type of shade whether it’s the blue or green shimmer has been done before (Mac’s Blue Brown pigment, Mac Club, Urban Decay Lounge, Makeup Forever Peacock / ME 302 and Ardency Inn Peacock).